Starts at 10.15, until approximately 3pm. Gardens in North and South America: A Brazilian Odyssey, Mexican Fusion and Californian Dreaming. Marilyn Elm who trained as a landscape architect and garden designer gave a lively and inspirational study day on modernist gardens and their influence in design in America and Europe. During the early part of the twentieth century, there was a modernist movement by artists Mondrian, Miro and Kandinsky in creating ‘cubism’ as an art form. The use of geometric shapes and strong colours were reflected in the design of gardens. The architect Mies van der Roule who coined the phrase ‘less is more’ constituting the term ‘minimalism’. 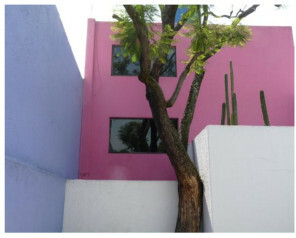 As a consequence, design became more brutal using large concrete shapes and stark spaces which were offset by the use of architectural plants such as cacti. Although these strong iconic images were not necessarily conducive to the English garden, they did give fresh ideas which could be adapted to suit, and as a travalogue piece, it was superb! 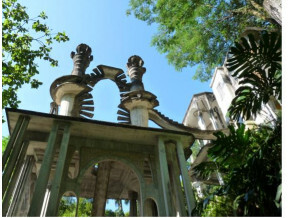 Roberto Burle Marx was Latin America’s most influential twentieth century landscape architect and an internationally renowned figure in modern art. He had a broad background in all art which included music. As an amateur botanist and expert horticulturalist, he gathered an important collection of plant species. He collaborated with Brazilian architects on both the national and international scenes. These included Oscar Niemeyer, Rino Levi and Lucio Costa and also associated with Marcel Breuer and the Swiss/Frech architect Le Corbusier. When creating gardens for public spaces and parks, he used indigenous plants. Historically, during the Aztec dynasty, gardeners created floating gardens for the growth of strong colourful plants and also to be used as market gardens. Influenced by Japan and also using pre Aztec design, Burle Marx created a colourful legacy from Rio de Janeiro to the iconic Brasilia. Luis Barragan was a Mexican architect and engineer. Influenced by Le Corbusier, he used simple forms of shape and structure combined with a creative use of light to design gardens. He was quoted as saying that a garden must combine the poetic and the mysterious with a feeling of serenity and joy. The American architect Thomas Church created gardens for a consumer society and wished to involve his clients in each design. In his book ‘Gardens are for people’ he created the concept of ‘decking’ and sort to intergrate the house and the garden with a free flow between them, so that people might enjoy outdoor living. 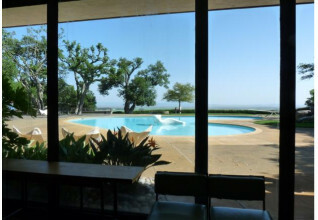 He designed the Donell garden in Sonoma, Caifornia where he created a ‘biomophic’ (amoeboid shaped) swimming pool. Topher Delaney who had suffered from breast cancer, was involved in the creation of the Narducci Organic farm in Napa Valley. The idea was to create a landscape for comfort, healing and faith.